I have been obsessing over this green colour for some months now. I’ve been thinking about it non-stop and was really happy when I finally found it in a glass rod to use. I stopped obsessing about it once I had bought some and just started to think about the colours that go with it. One thing I like about having a messy and disorganised desk is that you can see how two or more glass colours would look like before you melt them. This has fired up my tastebuds and I’m working on two necklaces at the same time. I’ll show you one for now and the other I’ll save for another time when it looks closer to what I had imagined. 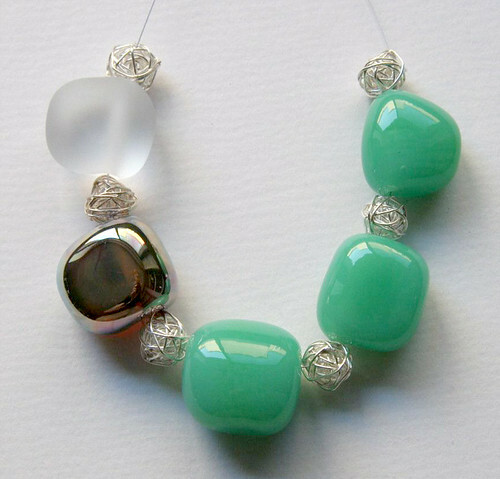 This one is simply matched with a frosted clear glass bead and a shiny silver glass bead with a few sterling silver wire beads. So I’ve had some play time and have come up with these square-ish glass beads. The shape is new for me and is a little unusual. These are free formed, meaning I didn’t use a pre-shaped mold to make them. So that means that they are all slightly different and I cannot get them to be all exactly the same shape as each other. But this is the nice thing about hand-made glass beads 🙂 Also, the weight is balanced to the bottom so that they won’t flip over while wearing them, well that’s the idea anyway. I’d imagined the shape and colour that would look quite elegant as short necklace. Not a choker style necklace but a bit longer. I’ll post that once it’s finished. I’m still tinkering with it. 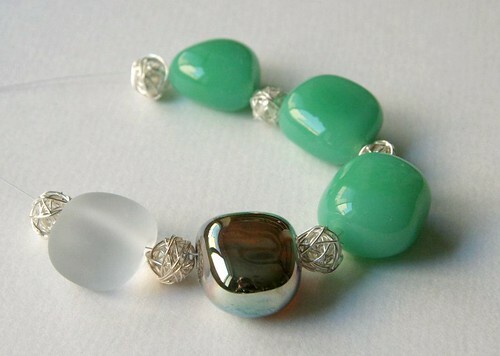 i really love this delicious bead colour…and it looks awesome with the silver and the frosted glass. Oh, and Irregularity Rules!! They look kinda like half-sucked lollies…MMMM! I’ve been making some more green beads lately. I am so in love with green atm. Maybe because it’s the weather, but I’ll post another blog with photos of them soooooon.